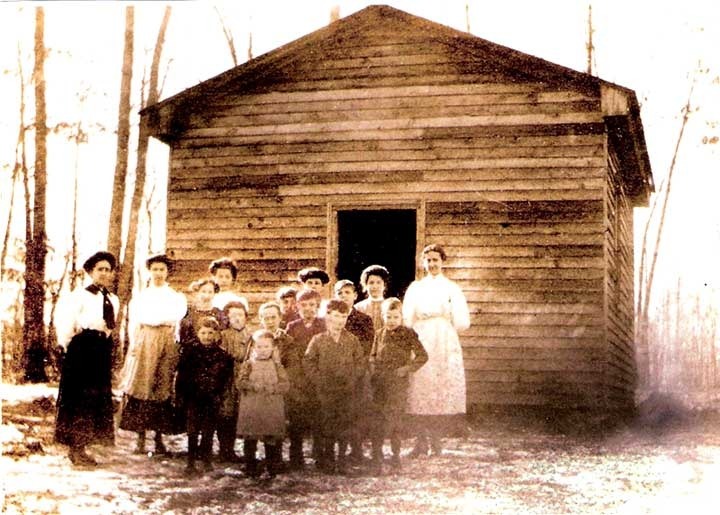 This photograph, taken by Mrs. Virgie Bell, on February 7th 1910, is of the Parrott School in Greene County, its faculty and its students. The school was located on the north side of Amicus Road, opposite what is now the western entrance of the Riverdale Subdivision. It was on the eastern edge of Bezaleel Brown Parrott’s Wakefield Farm; the lady standing far right is Miss Lucie T. Parrott, a teacher at the school, who was Mr. Parrott’s granddaughter. The fourth boy from the left is William (Willie) B. Parrott. The public’s assistance in identifying the others would be appreciated. The school was labeled District School #10 in Greene’s public education system. Miss Parrott taught at the school mainly between 1910 and 1919. Around 1920 she moved to the crest of the Blue Ridge Mountains on a personal quest to help educate the mountain children, and she taught at the Deane Mountain School for about 2 years. Photo and description are gifts of Woodie B. Parrott. Greene County Historical Society, “The Parrott School,” Piedmont Virginia Digital History: The Land Between the Rivers , accessed April 23, 2019, http://piedmontvahistory.org/archives14/items/show/116.